The dress code for the Prior Attire Ball last April did not limit what to wear over your ballgown when arriving, of course - a modern coat would have been just fine and maybe even practical if the weather had happened to be very bad. A simple scarf wrap would have been quite sufficient in good weather. But then again, when I found myself on the last weekend before the event having finished everything else in time I was inspired to make a last minute effort for some kind of more period-appropriate outerwear. 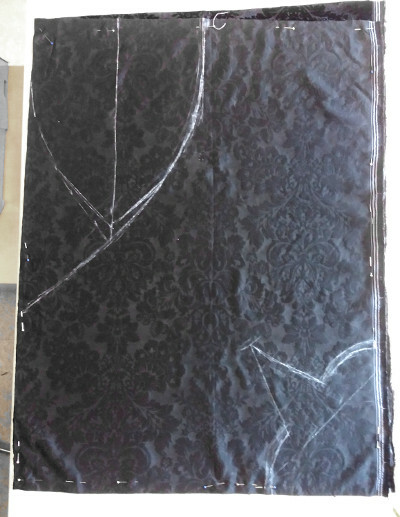 It was also a good opportunity to get rid of some old stuff in my stash - I thought that this piece of some sort of cut velvet with a baroque pattern I've had for ages had a nice semi-victorian look, and I might just manage to cut a short mantelet out of it. 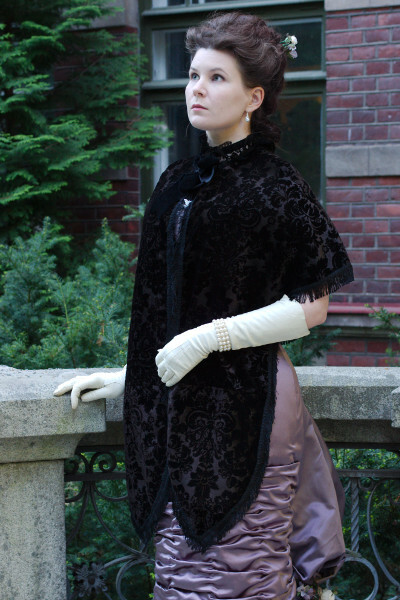 The pattern is heavily influenced by the "Mantelet for Evening"-pattern from "Fashions of the Gilded Age" (page 204), but combining elements of other patterns on the book. I tried to get most of the material I had, so I had to add several joining seams, hoping that they wouldn't be too obvious on the dark, patterned material. One join is in the front edged at waistline, another at center back, and then I further joined scraps left over from the neckline to lengthen the back, then cut it rounded. The material was a total hell to machine sew, and my seams ended up not too neat. Being an optimist on a hurry I also bag lined the mantelet with a modern thin satin lining with machine. In the end I had to unpick and sew again so many times and do some tricky parts by hand that I should have just sewn the lining on by hand to begin with. The ugly edges were to some extent masked by the fringe edging, which I had been a realist enough to plan to sew on by hand anyway. Besides, that way I could work on it on the road if pressed for time. Of course I had dreamed of a lush, long fringe, but they only had short fringe at the local shop - but then again it was not that expensive and probably more practical in use. 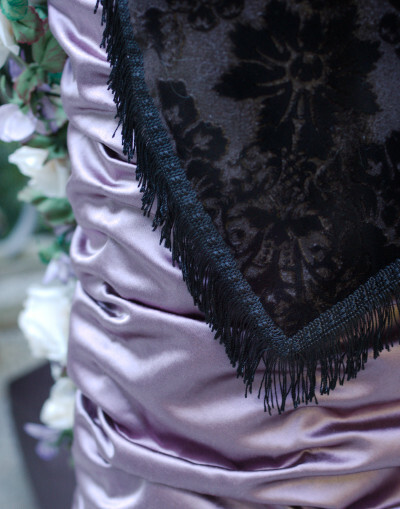 The fringe gave the mantelet a more finished look and added some nice Victorian flair. I finished sewing it in good time on the flight. The fringe was the only thing I bought for the mantelet. 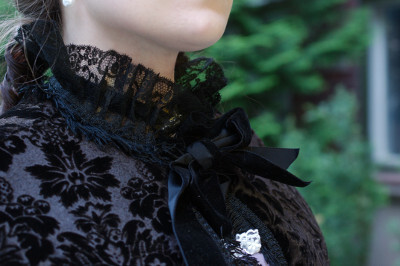 I found a random leftover scrap of lace from my stash for the neck and also wide velvet ribbon just enough for a small bow. These details were just thrown in for a generic Victorian look without any real research, but they look pretty to my inexperienced eye at least. The mantelet is not very neatly done if you take a closer look, nor it is terribly period-correct I'm afraid, but it was quick to make and serves its purpose. It's not very warm, but does provide some protection for bare shoulders, not least for decency's sake. For the wintertime I'll maybe make a proper warm Dolmain later, but this thin outerwear was ideal for packing. Being the perfectionist that I am, it was so much nicer to wear a cape rather than a modern coat, even if it was only for the ten minutes in taxi!